The Montgomery County commissioner announced an unusual plan: If he wins, he'll postpone taking office two months. Joe Gale, center seated, at his parents' Plymouth Meeting home in July 2016. Joe Gale has long considered himself a breath of fresh air in Montgomery County Republican politics. 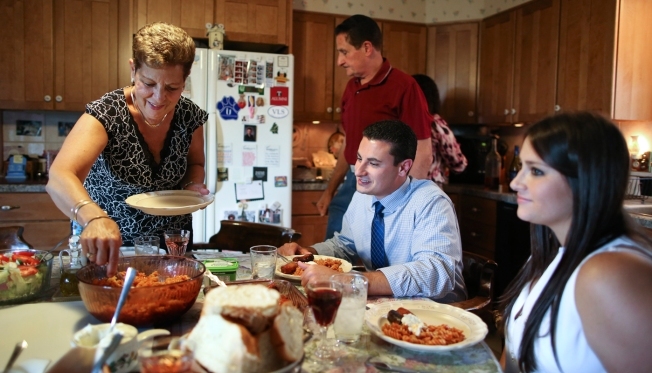 Now, the 28-year-old who in 2016 became one of the county's three elected commissioners is taking his brand of brash, upstart politics to all of Pennsylvania's voters. Gale announced Tuesday that he is running for the Republican nomination for lieutenant governor in the May primary. There is just one catch: Gale won't turn 30 — the age required for office by the state constitution — until March 2019, two months after the inauguration would be scheduled to occur for the elected position. He said in an email that a candidate doesn't have to be 30 years old to run, noting that he "had a legal team of lawyers and retired judges look into it." "You do not have to be 30 to run or be elected — you just must be 30 at the time of the swearing-in," he said. "So, I would have to wait only two months to assume office." The unusual plan of postponing a swearing-in is not new, Gale said, citing two other cases in which candidates won election to seats they were too young to occupy immediately. "There was a U.S. Senator from West Virginia, Rush Holt Sr., who was under 30 and had to wait 6 months to take office. And a Congressman from Kentucky, John Y. Brown, who was under the required age of 25 and had to wait until the second year of his term to get sworn in," Gale said. "For me, its only two months." He joins three others who have already entered the race on the Republican ticket: Gordon Denlinger, a former state representative from Lancaster County, Jeffrey Bartos, a real estate investor from the Philadelphia area, and Otto Voit, a businessman from Berks County. A large field of Democratic candidates also has emerged to challenge current Lt. Gov. Mike Stack in the primary. Stack, a former Democratic state senator from Northeast Philadelphia, saw his security team taken away last year by Gov. Tom Wolf. Stack and his wife reportedly verbally abused security staffers. The deadline for filing to run in the May 15 primary is March 6. Gale told NBC10 in 2016 that his surprising win in the Nov. 2015 election for county commissioner was a pre-cursor to President Trump's rise the following year. "My race was a microcosm of what's happening on the national scene now," he said in July 2016, alluding to Donald Trump's stunning rise to Republican nominee for president, and U.S. Sen. Bernie Sanders' enduring influence on the Democratic presidential primary. "You have to remember there was no Donald Trump yet." He often called himself Pennsylvania's first Trump supporter, and he made a bold prediction that came true. "I'm very confident Donald Trump will be the next president," he told NBC10 at the time. Gale said he is confident voters would find him worth the wait. "I can tell you this, the people of Pennsylvania would rather wait two months for me to get in there and clean things up than be stuck with 4 more years of the same old politics as usual," he said.